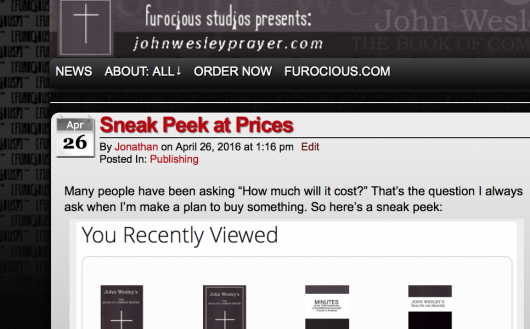 The production website for johnwesleyprayer.com has been up for a while now. There is a temporary link on the menu bar on this site for those who may have wandered here looking for the book. Of course the site looks very similar to this one…I want people to realize it’s all part of what I do here. What book? For those who don’t know I’ve been studying prayer and liturgy as part of my ongoing ministerial training. One of the projects I took on was a comparative study between The Book of Common Prayer (1662 BCP) and John Wesley’s 1784 version of the BCP. Out of that study I have been working on republishing a full version of John Wesley’s book and bringing it into modern media. In the process I have also printed two companion books that really make the collection complete. To find out more feel free to check out the website. Anyone interested? I would be willing to consider assisting with other book projects. If you have an old book you published ages ago and you want to bring it up to date, I can help with that. I’ve designed several printed books and fully indexed eBooks. Some of them can be found on my author page at lulu.com. One of the challenges of creating eBooks (especially 100 pages +) is making them so you can navigate through them quickly. John Wesley’s The Book of Common Prayer is 454 pages plus in the eBook there are an added 128 pages in bonus materials.